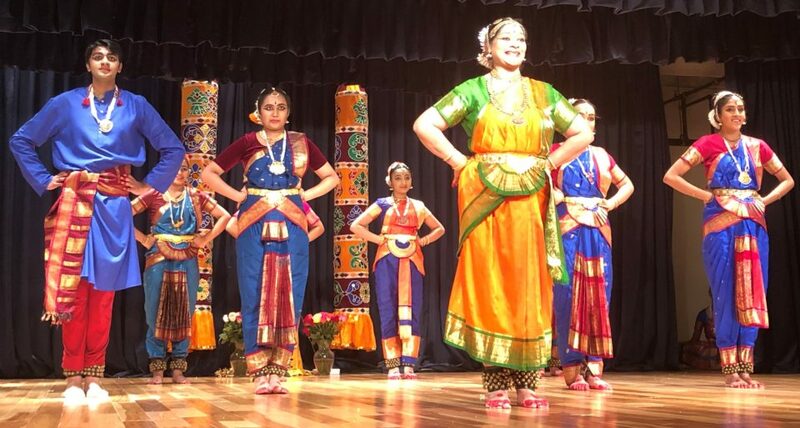 Atlanta, GA, April 3, 2019: A captivating Taalavaadyam and Bharatanatyam presentation, part of Samarpanam, a 2019 Student of the Year campaign by Walton High School students Anant Rajan and Emma Mason and their teachers Santosh Chandru and Bhavini Rajan, successfully raised $40K at the Hindu Temple of Atlanta on March 10, 2019. “Students of the Year, sponsored by The Leukemia and Lymphoma Society, is a philanthropic leadership organization aimed at fundraising and raising awareness for leukemia and lymphoma. The money raised during our seven-week campaign goes directly to LLS, where it will be used to fund research to find cures, promote advocacy for the disease, and help financially support families with a member fighting against the disease,” said Anant Rajan. Thaalavadyam, a repertoire of Carnatic songs and accompaniments as an ensemble, including question-answer, blended with individual Tani avarthanams, a segment where artists shine in their own light to show mastery of their respective instruments, as anchor Shipa Iyer described it later, was simply exhilarating. The ensemble featured Mridangam, the Tavil, and the Konnakol played by Guru Santosh Chandru, Violin by Tejas Manjunath, Mridangam by Aravind Narayan, Vajrang Kamat, Anant Rajan and Siddharth Poyappakam, Ghatam by Tejas Veedhulur and Morsing byGopi Venkatasubbu. The musical gem was a treat to Carnatic music aficionados. Bhavini Rajan, who had not performed on stage for a quite some time now, took to stage for the cause. Bhavini’s myriad layers of emotions portraying a lovelorn heroine or a hero rendered in slow tempo completely justified Padam, the pure Abhinaya item composed of lyrics and poetic verses. In Ashtapadi, she danced to enticement of Lord Krishna to the gopikas in Brindavana. Keerthanai, performedby Mriganayani Rajan, Krisha Gelli, Haarika Palacharla, Bhavana Chandramouli, Shreya Gelli, Ashwini Balaganesh, and Janavi Ramesh praised Lord Nataraja. Ashtalakshmi featuring Ananya Ganesh Achari and Shobana Santhanam brought alive eightfold Sri Lakshmi, Sri Ashta Lakshmi. Thillana, a piece dominated by the rhythmic syllables over lyrics was performed by performed by Mriganayani Rajan, Krisha Gelli, Haarika Palacharla, Bhavana Chandramouli, Shreya Gelli, Ashwini Balaganesh, Janavi Ramesh, Anant Rajan, and Bhavini Rajan. 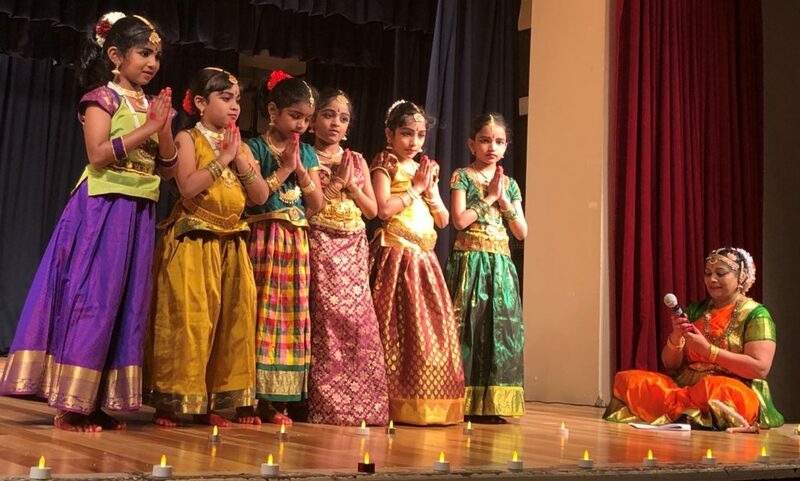 A sweet Diya Dance perfomed by 6-year olds Dikshita Mohan, Neha Bala, Sarah, Anu, Mahathi and Aaradhya wrapped up the presentation. Janavi Ramesh, in her vote of thanks talked about the disease striking very close to home, her mother, a survivor and her journey through diagnosis and treatment, making a heartfelt appeal for the cause. 1.2 Million people in the United States are living with or are in remission from a blood cancer. Team Cambiamondo which translates to Change the World in Italian, sure did their part justify their title.